Once the BluSynergy Connector for Salesforce CRM is installed and configured correctly, a typical use case is a "prospect" (or "lead") becoming a paying customer (or "Account" in Salesforce nomenclature). 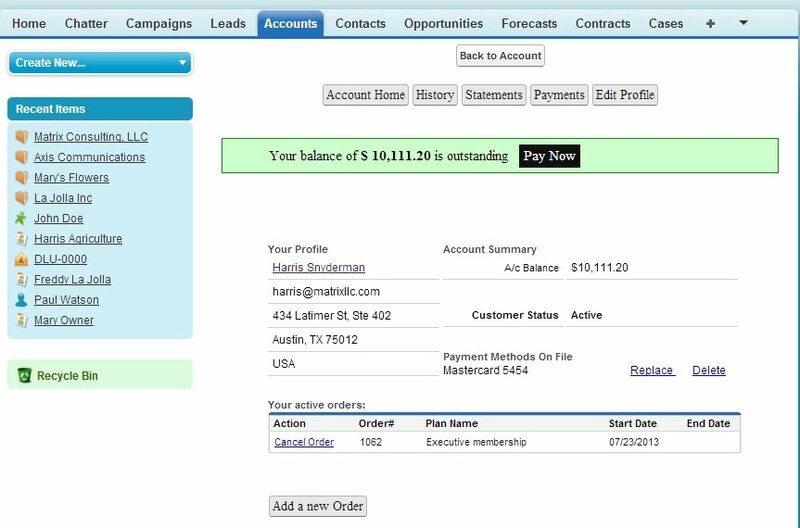 From within Salesforce, the Lead is converted into an Account along with one or more "Contacts". At this point, this Account along with one specific Contact may be exported from Salesforce into BluSynergy. The Salesforce Account maps to a BluSynergy "Customer" and the Contact maps to the "Billing Contact". The Account must exist with a valid, non-duplicate value for the "BluSynergy Customer No" field (this was the field that was configured in Step 7 of the configuration process). There must be at least one Salesforce Contact associated with Account that will map to the Billing Contact. This contact must have the following fields populated at a minimum: First Name, Last Name, and Email. The Email will be used as the BluSynergy login as well, so this must be a unique login within BluSynergy. The Account must not have been already mapped into BluSynergy previously. The "Billing Address" for the Account, while optional, is used as the postal address for the BluSynergy customer contact. If the above conditions are satisfied, then simply click the "Configure Billing Account" button on the Salesforce Account detail screen. At this point, you will be prompted to select the Billing Contact for the list of Contacts from this Account. 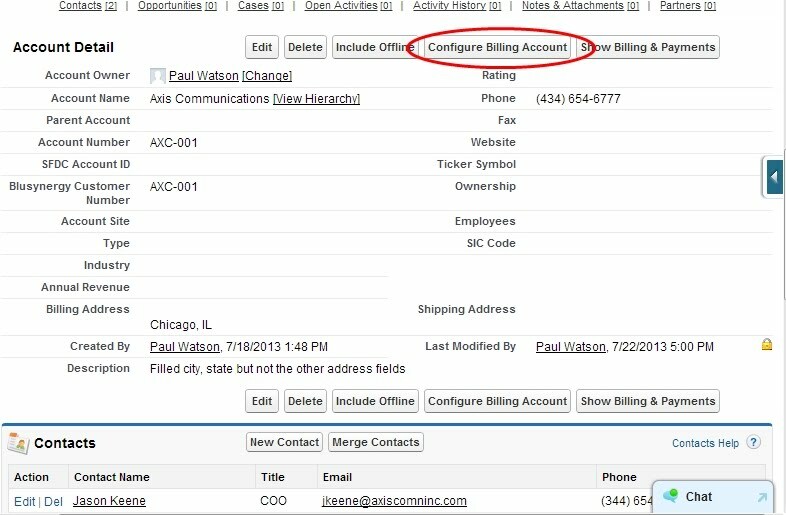 Clicking the "Configure Billing Contact" will cause both the Account and Contact to be created in BluSynergy. Navigate to the Salesforce Account page, and click on the "Show Billing & Payments" button. The billing and payment data will open with the familiar functionality and layout from the BluSynergy application. Note that the level of functionality that is available here is dependent on the configuration options in Step 4 of the configuration process).